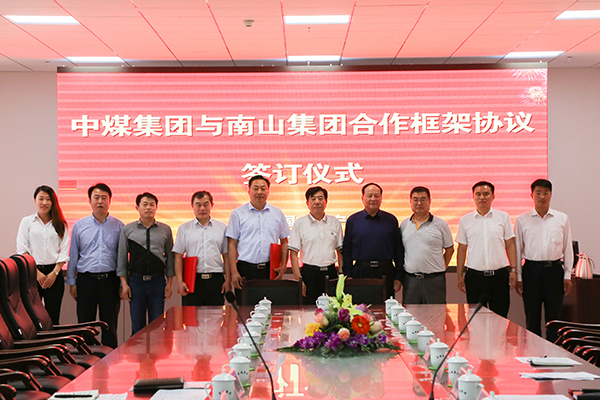 On May 11th, Yantai Nanshan Education Group Vice Chairman Yang Haiyi, Nanshan Group E-commerce Project Director Wang Kun, Nanshan Group E-commerce Merchants Project Construction Office Gao Director Debing and other leaders visited Shandong China Transport Group and held special consultation forum regarding Shandong Nanshan Zhongmei E-commerce Co.,Ltd. Shandong China Transport Group Chairman and General Manager Qu Qing, executive vice president Han Yong, Li Zhenbo, deputy general manager Fan Pei Gong, Sun Shijun, Li Zhaopeng, general manager of the Group's e-commerce company Yan Ting and other leaders accompanied reception. Under the leading of Manager Han and Manager Li, the Visiting guests visited the new office building of China Transport Group and e-commerce company, cross-border e-commerce company, network information company, software technology company, CD-agriculture technology company, Kate intelligent robot company, Intelligent terminal equipment exhibition hall, watched the live demonstration of high-tech UAV and intelligent robots which were independently researched and developed by the Coal Group's Shandong Kate Intelligent Robot Co., Ltd. , and all given high praised to the products. 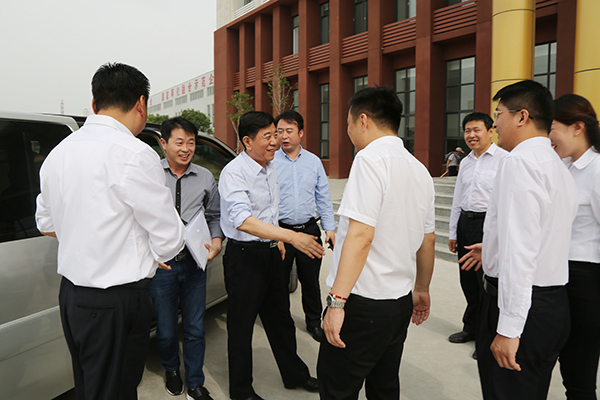 During the visit, Manager Li made a detailed introduction to the visitors on the achievement of China Transport Group in the e-commerce, cross-border e-commerce, new industry, e-commerce personnel training and other areas, praised by all of the Yantai Nanshan Education Group. Yantai Nanshan Education Group Vice Chairman Yang Haiyi said that the last visit to the Group, the new office building has not yet in use, and now just over a month, all the staffs moved into the style of high-rise buildings, let us personally feeling the vigorous development of China Transport Group, China Transport Group development concept is scientific, the development model is advanced, the development prospects are broad, this is the reason that Yantai Nanshan Group and Shandong Coal Group have reached so depth important strategic cooperation. At the symposium, Manager Han on behalf of the leading group of China Transport Group extended a warm welcome to Yantai Nanshan Education Group leaders and express high wishes for the future development of Nanshan Group and China Transport Group on build Shandong Nanshan Coal E-commerce Co., Ltd. Manager Han said that Yantai Nanshan Group as a top 500 enterprises in China, has a strong industrial base, China Transport Group as the Ministry of Industry and e-commerce innovation enterprises in Shandong Province, leading enterprises in e-commerce industry, e-commerce platform construction and operation experience is very rich, I believe the strong combination between Nanshan Group and the China Transport Group, can better use their respective areas of resources in the field of common development and long-term cooperation as the goal, through complementary advantages, strong combination, sharing of resources, to better achieve both enterprises win-win development! At the meeting, leaders of Yantai Nanshan Education Group gave a high appraisal of the perfect e-commerce model to our Group. vice chairman Yang Haiyi, said the China Transport Group in Shandong Province is the largest and most powerful industrial enterprises, and is the industrial enterprises development benchmark in province, we have visits China Transport Group many times, communication, the two sides with mutual benefit, sharing of resources, and ultimately to achieve the Shandong Nanshan China Transport E-commerce Company better develop. Hope that both sides with mutual benefit, sharing of resources, and ultimately to achieve with the Nanshan Group's industry, product advantages and the China Transport Group's power resources advantage achive powerful combination, to create an internationally renowned e-commerce brand. Subsequently, the leaders build specific work to convene a coordination forum.on the Shandong Nanshan China Transport E-commerce Company. The two sides were discussed on the e-commerce companies’ building work progress, the company's future development planning and specific operational programs, the company decision-making, supervision, management staffing and division of responsibilities, e-commerce platform development, preparation cost budget, professional and technical personnel allocation, staff recruitment , Training and treatment and other specific issues, and one by one to reach a consensus. At the meeting, in order to better promote Yantai Nanshan Group and Shandong China Transport Group in-depth cooperation, agreed by the leaders of the two sides, Yantai Nanshan Group will be large-scale investment in Jining, and Shandong China Transport Group jointly set up a joint venture to strengthen the two sides, A number of large projects in depth cooperation, to carry out various types of e-commerce training, project incubation in china. At the end of the meeting, held a grand cooperation framework agreement signing ceremony between the China Transport Group and Nanshan Group, and two sides took a group photo. The symposium further consolidated the strategic partnership between China Transport Group and Nanshan Group, played a great role in promoting the two sides actively expand cooperation in various fields and build international cooperation platform for e-commerce, laid a solid foundation for the two sides to achieve a win-win development of enterprises!